When most of us visualize olive-growing regions, we conjure up images of densely covered hills in the Italian countryside or sun-dappled groves in California. Time to refocus. 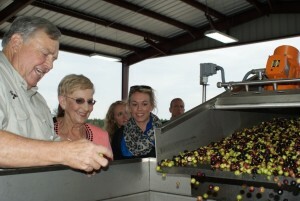 Georgia first lady Sandra Deal checks out the olive processing at one of the state’s operations. turning South Georgia, especially closer to the coast, into a high-yielding, well-respected olive-growing mecca. Thus, the olive oil central to celebrations of Chanukah can originate much closer to home than the Mediterranean or California. Two olive oil brands are being produced in Georgia, each with its own mill, but with high demand and favorable conditions, increasing numbers of growers are entering the fray to supply fruit to those two manufacturers. Vicki Hughes, the executive director of the Georgia Olive Growers Association, said Georgia had about 120 acres of olive groves three years ago. Today some 14 growers are producing Arbequina olives on 600 acres in the state. The association now has 60 members in supporting industries. Arbequina is a dense, high-yielding cultivar of olives that can flourish in drier conditions. It became an attractive option after the Georgia drought of 2007 and the ensuing economic downturn when farmers were searching for high-density, drought-resistant crops to cultivate. Research with the University of Georgia determined whether olives would grow and which types would flourish, and the fledgling industry was born. 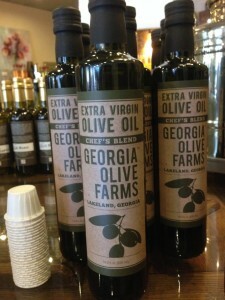 Both Georgia-grown and -produced olive oils are on the Strippaggio shelves. Tours and tastings are available at both Georgia Olive Farms in Lakeland and the smaller Terra Dolce in Lyons. In metro Atlanta, Georgia olive oil is featured at Strippaggio, a gastronome’s delight of a store that offers carefully curated brands of domestically produced olive oil and vinegar, gourmet salt and seasonings, fine cookware, coffee, and other culinary delights in a tasteful, rustic, apothecarylike atmosphere. Founder Celia Tully and her knowledgeable staff will consult with you to determine the type of olive oil and vinegar varieties that suit your needs and appeal to your palate. With two locations, at Emory Point and Ponce City Market, Strippaggio offers an impressive variety of proprietary olive oils and vinegars with large dispensers and tasting cups for the epi-curious. Tully took time to educate me about olive oil production and the industry in Georgia and will gladly do the same for any shopper. Tully said Terra Dolce raised the profile of Georgia-produced olive oil by entering its first-ever 2013 pressing in the International Olive Oil competition in New York in the spring of 2014 and winning first place against 700 competitors. She said Georgia oils are now well-received and are popular in her stores, where buying “local is very important” to many customers. Could there be a more fitting Chanukah gift than olive oil for your favorite cook or consumer?